Baseball playoffs are not the same as football playoffs. Social Media has become what message boards and sports talk radio used to be – an avenue for fans to express their feelings about their team. Facebook and Twitter allows instant reaction which can be a good and a bad thing. Reading the overreaction on social media last night led me to come to the conclusion that after 15 years, Baltimore fans forgot how the baseball playoffs work. We have adopted the football mentality of win-or go-home after all these years, but baseball doesn’t work that way. Just take a look at the playoffs this year. The San Francisco Giants and Oakland A’s were both down 2-0 and have climbed back to tie the series. The Orioles are in an elimination game tonight, but to compare last night’s loss to the AFC Championship loss just shows how out of touch the fan base has been from playoff baseball. I will say this though; the passion for baseball is back and I love it. I would rather feel the pain of last night any day of the week over the misery that has been Orioles baseball since 1998. Since August 1st, the Orioles have lost back-to-back games four times. Buck is again trusting Joe Saunders to deliver in a win-or-go-home scenario. Saunders delivered the last time against the Texas Rangers by holding the potent Rangers lineup to one earned run in 5 2/3 innings. He will have to be on his game again in order to force a Game 5. 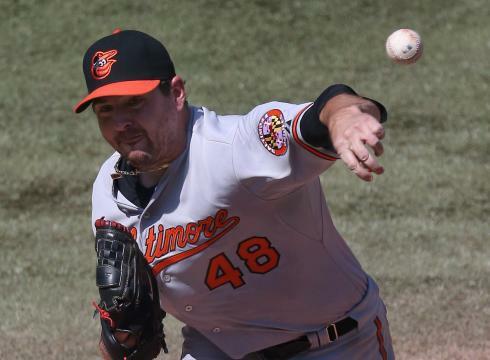 The decision was between Saunders and Chris Tillman, but as always, Showalter will trust a veteran player over a young inexperienced player. Over the last few years, fans and baseball experts have said that in order for the Orioles to return to prominence, their young pitching has to step up. Well, they were right. It just happens to be a different group of guys than the ones predicted. Brian Matusz, Jake Arrieta, Zach Britton, and the rest of the predicted “cavalry” aren’t leading this team. Rookies Wei-Yin Chen and Miguel Gonzalez are. Lost in the shuffle of last night’s defeat was another exceptional performance by Gonzalez. Gonzalez kept the Yankees’ lineup off balance for 7 innings. He only allowed 5 hits and struck out 8. Nothing seems to faze this guy. In the biggest game of his life in a hostile environment, he steps up and makes a power hitting lineup look weak. If not for Adam Jones getting a bad jump on a Derek Jeter triple, Gonzalez wouldn’t have allowed a run. Chen, Gonzalez, and Game 1 starter Jason Hammel are all young and stepped up when the team needed them the most. This could play huge dividends in years to come. Adam Jones joked after Game 2 that him and Matt Wieters were on vacation and they needed to come home. Game 4 would be a great time for that to happen. The Orioles are batting .208 in the first three games. 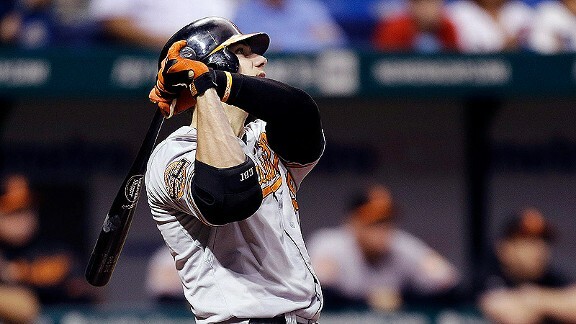 The O’s have relied on a player who was released by the Pittsburgh Pirates (Nate McLouth), a Rule V draft pick (Ryan Flaherty), and a 20-year-old (Manny Machado) to help them this series. Jones, Wieters, J.J. Hardy, and Jim Thome have combined for…4 hits! The slump started in Tampa and has continued in the playoffs. If the bats don’t break out, that will be the reason why this team does not advance to the ALCS. Jim Johnson will get the brunt of the blame. I am not saying he shouldn’t. He couldn’t keep a tie in Game 1 and blew a one-run lead in Game 3. It is his job to come through and he hasn’t, but getting the last three outs in Yankee Stadium in October might be one of the hardest tasks anyone is asked to do. His homerun to Raul Ibanez made Joe Girardi a genius and saved him from being asked why he would sit a Hall of Famer in the most crucial spot of the game. However, the offense has looked lost, and with CC Sabathia waiting in the wings on Friday, tonight would be a great start in getting their confidence back. Your first playoff game as an announcer and you drop the line that Adrian Beltre is a better defensive third baseman than Brooks Robinson. This happened to be in the game that the team you rooted for and played for your entire career was playing in. Your first playoff series you are announcing happens to be the team you played for against the team that everyone in your city despises. If you say one little thing that sounds positive in favor of the Yankees, you were going to get crushed by your hometown fans. If you say one little thing that makes you sound like a homer, you were going to get crushed by the baseball world. Cal decided to take the approach of not sounding like a homer and it has made the Baltimore fan base lash out. I blame TBS. Cal was in a no-win situation. His knowledge of baseball is getting lost in the telecast. TBS was better off having him announce another series where he wouldn’t be judged so carefully. Sorry for the lack of posts here Nestgoers. It’s been a hectic few days here for us, but just know that we have been sharing every bit of excitement with you, living and dying with every pitch during the O’s wild card win against Texas and through the first two ALDS games against New York. First, Friday night – Congrats to the O’s for taking down the defending American League East champion Rangers behind a great performance by veteran Joe Saunders. It was absolutely incredible to finally get to watch the O’s celebrate proper, showering each other with champagne in the locker room. The hearts of Baltimore fans were full watching this team, who have given us so much to celebrate all year, finally get to party a bit after being denied the same chance on their home field by the Rangers earlier in the week. Poetically, it was Joe Nathan who blew the save against Anaheim Sunday as the Birds and their fans watched at OPACY, denying the team and fans a great moment, and it was Nathan against whom the O’s added some much-needed insurance runs Friday night to secure the victory. While ALDS Game 1 didn’t end the way any of us would have liked, Game 2 delivered in a big way. Oriole Park at Camden Yards was a madhouse for both games, as O’s fans who have been starved for October baseball for 15 years packed the park, leaving precious few seats for fans of the Evil Empire from up north. I changed my flight from Kansas City – where I had watched the Ravens beat the Chiefs in a snoozer on Sunday, 9-6 – to come back to Baltimore in time to catch Game 2 in person, and it’s a decision that I will be glad I made for the rest of my life. I’ll never forget last night at the Yard. Despite a couple really bizarre plays – like Ichiro dodging Matt Wieters’ tag at home plate despite being out by several steps, and J.J. Hardy failing to pick up third base coach Demarlo Hale and failing to score on an Adam Jones two-out base hit – the Birds overcame and pulled out the 3-2 victory. Rookie Wei-Yin Chen shined in his first MLB postseason start, holding down the Yankees potent bats into the seventh inning. And, after getting beat around on Sunday, Jim Johnson came out of the bullpen angry on Monday and mowed down the top of the Yanks’ order 1-2-3 to secure the win. The O’s now head to New York – where they were 6-3 during the 2012 regular season – needing to take just two of three games to advance to the ALCS. That’s right, Birdland – your O’s are just two wins away from the Championship Series. Incredible. Updated version of "Orioles Magic"
Some local Baltimore artists and fans decided it was time to update the Orioles Magic song. What do you think, Birds fans? I certainly enjoy the video, but I think I prefer the retro, silly, classic lyrics and song style. Here’s the old one to compare. Game 162 again crucial. Also, thanks for nothing, Boston. With the final day of the MLB regular season upon us, there are still a multitude of potential scenarios in the American League playoff picture. Though we know the five teams that are in the postseason, who will play who, when, and where is all still very much up in the air. This morning, the Yankees (94-67) are one game ahead of the Orioles, who are tied with the exact same record as the Rangers and Athletics (93-68). We were robbed the chance of having all four of those teams enter the final day equal in the standings by the Boston Red Sox incompetence last night. Boston held a 2-1 lead for most of the game in the Bronx, extended that lead to 3-1 in the top of the ninth inning, but “closer” Andrew Bailey allowed a single to Curtis Granderson and a two-run game-tying home run to 800 year-old Raul Ibanez. A home run that probably would have been a home run in all of zero other major league ballparks. The Yankees ultimately won, 4-3, in the bottom of the twelfth on a seeing-eye single by the aforementioned 1200 year-old Ibanez. Forget steroids, I want every Yankee player tested for Fountain of Youth water. It’s ridiculous the contributions that squad gets from geriatric players year after year. The O’s pulled off a most unlikely win in their own right down in Tampa. Facing Rays pitcher James Shields, the Birds couldn’t hit the broad side of a barn, striking out 15 times against Shields, who tossed a complete game two-hitter on just 107 pitches. Luckily, one of those two hits traveled roughly 440 feet off the bat of Chris Davis (his sixth straight game with a home run, and seventh in that same stretch!) His solo home run accounted for the only scoring by either team on the night, as Miguel Gonzalez, Brian Matusz, Darren O’Day, and Jim Johnson combined for a two-hitter of their own in shutting out the Rays. Unfortunately, O’s fans who dared to dream of going into the final day tied with the Evil Empire had our hearts crushed by the ineptitude of the Red Sox and their always-trolling-somebody manager, Bobby Valentine. Thanks to the Sox being a doormat, the best the O’s can hope for is to win today and have Boston salvage one game in New York. In that case, there would be a one-game playoff for the American League East crown played Thursday at Oriole Park at Camden Yards. Should the O’s win and the Red Sux continue to play like a little league squad, the Birds would finish a game out of first place, despite a valiant effort over the season’s final two months. They would be relegated to the wild card play-in game, which would be against the loser of tonight’s Oakland/Texas contest. As long as the O’s win the finale in Tampa, the wild card game will be played in Baltimore. If, however, the O’s lose to the Rays tonight, they would finish tied with whoever loses the AL West. Because the Birds lost the season series to both Oakland and Texas, they would be forced to travel to one of those two cities for the play in game. We can play “pick your poison” between those two squads all we want, but no situation seems ideal, all factors considered. The A’s are red-hot, even if they lose tonight, and facing them in Oakland would be going into a Lion’s den, while seeing them in Baltimore is only slightly more appealing. Facing the Rangers, who would have just completed a devastating collapse to lose the division, might seem like a better option. They will be disheartened and shell-shocked, and the O’s may be able to jump on them in that one-game playoff. However, the O’s would likely be facing Texas phenom Yu Darvish in that game. Not only is Darvish a certified ace already in his rookie year (16-9, 3.90, 221 K; 3 ER or fewer in his last 8 starts, 1 ER or fewer in 5 of last 7), but it would be the Birds’ first time facing him. We all know how the O’s can make even AAA call-up scrubs look like Cy Young the first time they see a new hurler. On top of that, the Rangers – for whatever reason – seem to own Oriole pitching, and nightmares of 30-3 games and four HR explosions by a single player will have O’s fans shaking in our cartoon bird hats if the boys from Arlington are slated to come to town. Throwing another wrench into things is that the Oakland/Texas game today is an afternoon contest. Thus, the Birds will know who their opponent would be on Friday before they even take the field in Tampa. What all of this boils down to is that the best-case scenario for the O’s is still to tie with New York. They need to win tonight and have Boston win, which would result in two chances (the one-game division playoff and the one-game wild card play-in) to win a single game to advance to the ALDS. It’s been a whirlwind year for baseball here in Charm City. Nobody is ready for it to end yet. Let’s all hope that we wake up tomorrow once again tied for the AL East lead, and will be guaranteed at least two more baseball games. Let's Go O's! On to the playoffs! The last time our Baltimore Orioles clinched a playoff berth I was 4 years old. This is new territory for myself as well as the generation that was “lost” in close to a decade and a half of consecutive losing seasons. But that’s all in the past now – we are losers no more, we are playoff starved no more. But this ride doesnt feel like its coming to an end anytime soon. We are still hungry for more and by all rights we should be! For many Orioles fans who have watched from game 1 to now game 160, we know just how high the ceiling for this team is, and I dont think they have hit it. This final three-game series in Tampa cant change the fact that the Orioles will be in the playoffs but it could help determine just how comfortable their postseason experience will be. First and foremost the O’s have to keep wining if they want homefield advantage and they will need either some help from Boston -who pens a 3 game set with New York -or they could see themselves in a one game division-settling playoff before the actual playoffs even start. But over the past few games watching this team, they are so dialed in and so focused on the task at hand that i think they are capable of more than just the division title. I’m talking about catching Texas, I’m talking about being the number one seed in the American League. Don’t mistake this for being overconfident in a team that has put together a magical season or being drunk off my teams first playoff berth that I will be able to remember. This is as much a possibility as anything else that has happened this season and in all honesty why not the Orioles? Would it surprise you if Texas happened to go 1-2 in their final three and we pull out a sweep of a very good Tampa team? Well probably but at the same time not really. This team has been proving doubters wrong all year and now, and with three games left, they have a chance to hopefully silence their critics for one last time before heading into the playoffs. How sweet would it be Baltimore? To be able to cheer on our team at home, which if the crowds for those games turn out to be anything like the crowds during this past series against Boston, could prove to be a significant advantage for the Birds. Camden yards was electric this weekend, as I saw, being lucky enough to be in attendance for the final two home games of the season. Never have I seen Oriole Park so alive, never did I think I would be part of a “Lets Go Texas!” chant at an Orioles/Red Sox game – but I was and it felt awesome. This is going to be one hell of a ride and surely one that regardless of the outcome all of us proud Baltimore fans can look back on and smile. It's O-ffical. Birds are in postseason for first time since 1997. I woke up this morning and checked the standings just to make sure it was still real. The Baltimore Orioles have clinched a playoff berth for the first time in 15 years. While it’s absolutely a shame that the Texas Rangers blew a ninth inning lead in the first game of their doubleheader, and in the process denied the O’s the chance to celebrate on their home field along with the entire Camden Yards crowd who had stuck around to watch with them, the fact is that the Rangers eventually took care of business in game two, beating the Los Angeles Angels 8-7 to cut the Birds’ magic number to zero. It would have been an incredible moment to see the team learn that they had earned a postseason berth as they stood on the field for the final time of the regular season in 2012. Alas, the fact that they are even here at all is storybook-worthy. As Luke Jones of WNST put it so perfectly, it felt fitting that this team – so used to fighting, scratching, and clawing for every inch – had to wait just a few more hours to pop the champagne. And who is writing this script, by the way? Adding another ridiculous turn to the tale, the Birds’ plane actually had to make an emergency landing on the way to Tampa last night after a small fire started in the kitchen. This led to a bevy of jokes on twitter and facebook about the team – 19-9 in the month of September – being so “hot” that they were causing spontaneous combustion all around them. While humorous, there is nothing funny about a plane fire. We’re all glad our O’s are safe on the ground this morning to continue their improbable run. In addition to the fire, another odd part of the story is that former Oriole, fan favorite Koji Uehara played a role last night, retiring the Angels 1-2-3 on three straight strikeouts in the eighth inning to preserve Texas’s slim one-run lead. They are 92-67 today, tied with the New York Yankees for the AL East lead, and just one game behind Texas for the best record in the American League. The next three days will mean the difference between a division crown and a home or away wild card playoff game. The Birds take on the surging Tampa Bay Rays, who have won 10 of their last 11 games and are still mathematically alive for a spot in the postseason, while the Yankees get the hapless Red Sox at home. The Oakland A’s are in Texas, where a sweep would give them the AL West crown, as they sit just two games back. Hopefully Texas and Oakland beating up on each other will at least keep the Birds in the top wild card spot, as they have a slim 1-game lead at the moment. Buck’s Birds have their work cut out for them. A sweep in Tampa on the heels of their sweep against the Red Sox this weekend will, in all likelihood, result in an AL East title (of course, we need the Red Sox to win at least one game). Anything less will probably give us a one-game playoff at OPACY on Thursday night for the AL East crown as a best-case scenario. It will continue to be stressful to watch these next three nights, but regardless of how things play out between now and Wednesday, nobody can take this away from us. Congratulations, Buck, Adam, Matt, Jim, J.J., Nate, Manny, Nick, and the rest of the team. You deserve to celebrate a little while remaining focused on more lofty goals. And congratulations, Oriole fans. We deserve this. If you see someone else wearing orange on the street today, give them a high five, or at least a knowing nod. October baseball in Birdland in 2012 – who saw this coming? Now that’s how you get the bats out! After I spent yesterday lamenting the lack of offense that had engulfed the Birds over the past four games, they broke out in a big way in their final contest with the Blue Jays of 2012. Though it looked to be another case of a struggling starting pitcher getting the better of them, as Carlos Villanueva allowed only one run on two hits – the run on a Nate McLouth home run to lead off the game, the second hit an Adam Jones double with two outs in the fourth – through four innings, everything changed in the bottom of the fifth. Jim Thome led off the inning with a solo home run to right that tied the game at two. After two quick outs, Manny Machado finally belted his fifth home run of the season, giving the Birds a 3-2 lead that they would not relinquish. However, they were just getting started. McLouth and J.J. Hardy followed with singles, and Chris Davis finished up a great at bat with a three-run home run to right-center field that put the O’s up 6-2. Mark Reynolds added a two-run dinger in the bottom of the sixth to pad the lead to 8-2. Davis homered again in the bottom of the seventh with Hardy again aboard to make it 10-2. Then in the bottom of the eighth, Machado capped things off with yet another bomb, this one a two-run shot to round out the scoring at 12-2. If you’re counting, that’s SEVEN home runs by the Birds in one game, and six in the span of only four innings. McLouth (1st), Thome (5th), Machado (5th), Davis (5th), Reynolds (6th), Davis (7th), Machado (8th). It was just the second time in O’s history that they have hit seven home runs in a single game, with the other occurrences coming on August 26, 1985, and May 18, 1967. The win was not only crucial because it secured the four-game split with Toronto and showed that the Birds still have some pop in their bats, but also because every other team that we care about won as well. The Yankees, A’s, Angels, and Rays were all victorious on Wednesday, so the win kept them all in the Birds’ rearview for the moment. Starting play on Thursday, the O’s are 89-67, 1.5 behind NYY in the AL East, 0.5 up on Oakland for the top Wild Card spot, 2.5 up on Anaheim, and 3.5 up on Tampa. The O’s are idle today, but in other action the A’s finish up their series with the Rangers at 2:05 ET, the Mariners and Angels conclude things at 3:35, the Yankees start a four-game set in Toronto and the Rays start a four-game set in Chicago tonight. So there will be PLENTY of scoreboard watching going on. Let’s go Blue Jays, Mariners, Rangers, and White Sox! Starting Friday, the Birds welcome in the Boston Red Sox for their final home series of the regular season. The Sox are a struggling bunch at the moment, having lost two straight and six of seven (two of those coming at the hands of the O’s), but don’t think they won’t have revenge for 2011 on their minds when they come to town. Let’s hope the Birds’ bats stay alive and mighty to close out the season. They need to jump out to a big lead in every game against the BoSox and get a critical sweep to continue to control their own destiny. You are currently browsing the archives for the Orioles category.